NEW YORK – The Florida farmhands who pick the tomatoes that garnish Wendy’s hamburgers have a beef over worker’s rights with the fast food giant. Nearly 200 workers and activists picketed a Wendy’s Restaurant on East 14th Street near Union Square Tuesday afternoon, demanding that Wendy’s International, Inc. sign a “fair food agreement” with the Coalition of Immokalee Workers. The group represents laborers in the Florida tomato industry, which is centered in the town of Immokalee in Collier County, near Naples. The agreement would help raise wages and improve working conditions for the laborers that pick tomatoes that are purchased by Wendy’s from growers in Florida by raising the wholesale price of tomatoes by a penny per pound. According to the Coalition of Immokalee Workers, that cost would be passed up the supply chain to the workers, resulting in higher wages. According to Perez, a native of Guatemala, working conditions have improved since the Coalition of Immokalee Workers started the Fair Food Program in 2005. Since then, 11 corporations have signed agreements with the program, including fast food giants Yum! Brands, Mcdonald’s, Burger King, and Subway, according to the group’s website. Wendy’s is the largest fast food chain in the country that has not signed such an agreement. One protester, holding a sign reading “Your burgers may be square, but your food ain’t fair!” thought that the treatment of farmworkers is indicative of the disconnect between immigrants and mainstream American society. While the protesters chanted and waved signs resembling tomatoes, as well as an effigy of Wendy’s red-headed corporate mascot, three representatives of Wendy’s stood in front of the restaurant. They refused to give their names or comment on behalf of the local franchisee or Wendy’s International, the Dublin, Ohio-based parent company. 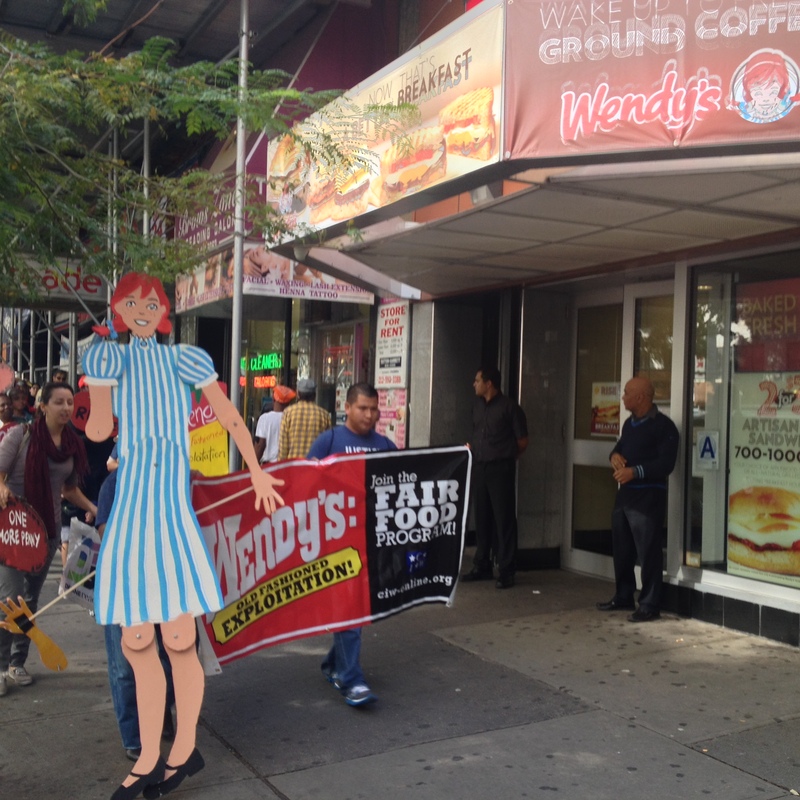 Representatives of Wendy’s International stand outside of a Wendy’s restaurant on East 14th Street in Manhattan as protesters picket, demanding the chain agree to help improve working conditions on Florida tomato farms. Wendy’s International Senior Vice President of Communications Denny Lynch did not respond to a voicemail seeking comment by press time. Towards the end of the protest, the groups attempted to give a letter asking Wendy’s International CEO Emil Brolick to sign a fair food agreement to the three men representing the fast food chain. They refused to accept the letter. Brolick has served as CEO of Wendy’s International since 2011. In 2005, Brolick was president of Taco Bell when the chain signed a fair food agreement with the Coalition of Immokalee Workers. “As an industry leader, we are pleased to lend our support to and work with the CIW to improve working and pay conditions for farm workers in the Florida tomato fields,” said Brolick in a 2005 Taco Bell issued a press release about the agreement. As the protest concluded, organizers addressed the assembled protesters, telling them that the letter to Brolick was not accepted.